When naming its two championship golf courses – The Outlaw and The Posse – Paradise Pointe paid homage to Clay County’s famous James brothers: Frank and Jesse. While it’s possible the James boys may have once roamed the rolling hillsides which now surround Smithville Lake, they wouldn’t recognize the terrain today as the manmade lake was created in the 1970s with the damming of the Little Platte River. Today the area is home to a wide variety of wildlife. Enhancing the beauty is that the courses reside on land owned by the Corps of Engineers, so they aren’t lined by housing developments like many area courses, lending a bucolic feel to the open terrain. The courses are owned by Clay County and run by Midwest Golf Management. The open landscape and proximity to the lake also bring the prevailing winds into play, which can provide contrasting play from one day to the next, and will give golfers pause before deciding their next shot. The other important feature of Paradise Pointe is the lake. Several holes, especially on The Posse, play alongside or across parts of the lake, imposing a severe penalty on imprecise shots. In general, The Posse plays closer than the Outlaw. Designed by Craig Schreiner, The Posse opened in 1982. The par-72 course with blue grass fairways plays 6,768 yards from the back tees. The course is rated at 71.8 with a slope of 125. For a different feel, golfers can try The Outlaw. The newer Outlaw plays 7,016 yards from the back tees with a rating of 74.3 and a slope of 138. While the Posse is a shorter course, it can be more challenging because of the possibility of irregular lies. The Outlaw features a couple of signature holes, including par 3 number 10. A source of pride for Paradise Pointe is their four-hole Academy course. “When we built the Outlaw, we actually took four holes from the original Posse golf course,” Hall explained. “We added four holes on the lake to the Posse and we took the first four original holes of The Posse. Those holes actually go around the driving range: two par fives, a par four and a par three. It’s not a pitch and putt; they’re regulation golf holes. The Academy – for which Paradise Pointe does not accept tee times – is an ideal place to learn the game. A recently completed Junior Golf Camp held at the Academy was so well attended that a second four-day Camp is being planned for later in the summer. “We had over 40 young golfers in that,” Hall said. “We utilized our range, our putting green, as well as the Academy; it’s a great facility for us, the Academy. Youth golfers aged 6 to 14 came from all over the Northland. 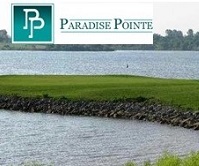 Paradise Pointe, which participates in the Kansas City Cup, is also home to several popular leagues – men’s, women’s and senior’s – and is proud to host a large number of tournaments with over 125 events planned each year. The success of the tournaments is shown by how many return to the facility. The Midwest ATBI tourney has been at Paradise Pointe for 20 years and September’s Chip In For Charity Tournament, which benefits North Kansas City Hospital, will enjoy its 25th year there. The popularity of the tournaments and leagues speak to Paradise Pointe’s overall approach. “I like our philosophy,” said Hall who is in his 16th year at the facility. “Our philosophy is that we want to create a nice experience for our clients to come out. We believe wholeheartedly if we do that and they have a good time, they’ll come back. That’s what we try to focus on. We love dealing with people, as evidenced by very active leagues. We have very active returning golfers every week and also just as important, we have tournaments that return. Those who have been to Paradise Pointe know how enjoyable the experience can be, and those who haven’t should give it a try. “It would be a great opportunity to come out and enjoy the scenery, enjoy the wildlife, enjoy the pleasurable experience that people would have on two championship golf courses,” Hall said. Some people enjoy the familiarity of playing their favorite golf course each week, allowing them to understand every undulation of the greens, even to know every blade of grass. Others though appreciate the challenge and excitement of visiting new courses. The Kansas City area has dozens of courses that are within a relatively short drive. These hidden gems are reasonably priced and provide a nice change of pace. We’re going to highlight five golf courses in the Kansas City area that you may not have visited recently, three of which fit under the Great Life KC membership package (the first three below). And to make the most of your trip, we’ll highlight some can’t miss attractions and restaurants you can visit along the way. Who knows? Perhaps you’ll find a new favorite course by taking one of these day trips! The Course: The country club, established in 1898, features an 18-hole course that underwent a renovation in 2003. The course offers tree-lined fairways with bent grass greens. The par-71 course measures 6,582 yards from the back tees and 5,992 from the white tees. The toughest holes include the par-4 443-yard sixth and the par-5 529-yard 10th. Day Trip Attraction: If you’re a fan of the Old West, St. Joseph is home to the Jesse James Home Museum, which is the home in which a member of the gang shot and killed James (but has been moved to its current location), and the Pony Express Museum, which includes historical artifacts related to the Pony Express. Eats: Consistently ranked as one of St. Joseph’s top restaurants is JC Wyatt House. Located downtown, JC Wyatt House is a little pricier than average, but the great food and the look of this restaurant, located in a historic Victorian 1891 home, is a lot different than most restaurants. The Course: The 18-hole country club course features water on several holes, adding to the challenge of playing at Tallgrass. The par-71 course measures 6,758 yards from the back tees and 6,195 from the white tees. The toughest hole on the front nine is the straight-away par-4 sixth, measuring 420 yards from the back tees. On the back nine, the 454-yard par-4 16th challenges long hitters. Day Trip Attraction: Wichita has been associated with aviation for many years, thanks in part to Boeing being a significant employer and to a large U.S. Air Force presence. The Kansas Aviation Museum in Wichita is located in Wichita’s former airport and in a former U.S. Air Force building. Eats: The Newport Grill specializes in steak and seafood, offering a series of entrees that aren’t duplicated elsewhere in Wichita. The restaurant is well known for an outstanding Sunday brunch offering as well that you could eat before heading to Tallgrass. The Course: The Leavenworth Golf Club is an 18-hole par-70 course measuring 5,925 yards from the back tees and 5,580 yards from the white tees. The most challenging hole on the front nine is the 360-yard par-4 fifth, which requires an approach shot over water, while the back nine’s toughest hole is the 372-yard par-4 10th, also involving an approach shot over water. It originally opened in 1920 as a private course, but now is open to the public. The site includes a full fitness center, as well as a swimming pool. Day Trip Attraction: The Fort Leavenworth Army Installation was one of the first posts established west of the Missouri River. The grounds include the impressive Buffalo Soldier Monument. Understand that this is an active military base, so security measures are enforced. You may want to research what’s involved before visiting, because passing through security can be time-consuming. Eats: Leavenworth is well-known for being home to a U.S. penitentiary, and the Metropolitan Steak House is known as, “The Little Steak House Across from the Big House.” It’s a traditional steak house with excellent food, including steaks, burgers, sandwiches, appetizers, and sides. It’s a perfect stop after a day of golf! The Course: Clinton Country Club was founded over 100 years ago, making it a historic stop, as well as a fun day of golf. In 1992, it was extended to an 18-hole course with a clubhouse, driving range, pool and tennis courts for its members. The course is a par-72 layout that measures over 6500 yards from the back tees. The front nine is headlined by opening and closing par-5s – both at a moderate length just under 500 yards. The back nine plays longer, with a challenging par-4 13th that plays as along as 424 yards from the tips. Before, during, or after the round, the casual dining “Sweet Spot” features breakfast and lunch options. Day Trip Attraction: Clinton sits near Truman Lake, known as a fantastic fishery for bass and crappie anglers. The lake covers 56,000 acres and includes several public use areas and two marinas. Fishing guides are available to take you out to find what’s biting. In addition, the Katy Trail State Park starts in Clinton and is a 240 mile long developed rail-trail that stretches all the way to Machens with 26 trailheads and 4 fully restored railroad depots. Katy Trail is open to hiking, bicycling, and horseback riding and offers scenic views as it wanders along through historic small towns. Eats: Mallard’s Roadhouse is easily accessible right on Hwy 7 and is known for big burgers, hearty steaks, and “home cooking” like fried chicken, catfish, and BBQ. El Camino Real is a favorite for authentic Mexican food and Square 109 is where to get a hearty breakfast before hitting the links or the lake. Square 109, like the name suggests, is right on the historic downtown square. The Course: The 18-hole public executive course opened in the late 1980s. The Club at MariMack opened a new clubhouse and swimming pool in 2015, as well as a sports bar and restaurant in the clubhouse. It’s a par-54 executive course measuring 2,417 yards that’s great for a day trip, because you can play the entire 18 par-3 holes in just a few hours. The 209-yard first and 183-yard 18th are the two longest holes on the course. Day Trip Attraction: If you appreciated the Old West attractions at St. Joseph we mentioned earlier, you’ll want to visit the Jesse James Birthplace Museum in Kearney. Guided tours are available as well as numerous attractions and historical artifacts for viewing throughout the grounds. Eats: The Slivinskis Bakery offers freshly made pastries and donuts daily, making this a great place to stop before heading to the golf course. Just make sure you stop here early, because the local residents love this place and may buy out the donut selection before lunch time! Utility Clubs. That’s what “hybrids” were once dubbed, in their infancy, when they seemed like more of a novelty than required equipment. The most memorable of the early versions was Cobra’s perfectly named “Baffler,” both for its looks and its wide range of uses. Was it a wood or an iron? Could you really hit it out of the rough? The answer to both was a resounding yes. 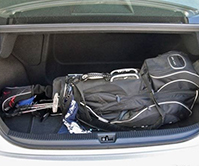 Utility clubs could be used out of seemingly any length of grass, as a wood or as an iron. Heck, you could putt with one if you so desired. These clubs are no longer known as “utility clubs” but as hybrids, and they are no longer novelties, but must-haves in the bag, regardless of handicap. No brand, it seems, is passing on the trend to expand their lines of clubs to include at least one featured hybrid, if not more. Callaway leads the pack with three models while Cobra, Ping, and TaylorMade (all featured here) are among the dozens of hybrid manufacturers. The first, alphabetically, of three Callaway hybrids, is the Apex. It is the most iron-like of the bunch – and that’s exactly what Callaway was going for. It looks like an iron, and it performs like one, adding a bit of distance and height to the ball flight, thanks to its Forged Face Cup, which aims for a faster response on contact – a pop off the face. This hybrid is one of the few on the market that is tailored specifically to the lower-handicappers and pros. It boasts a center of gravity very similar to an iron, which results in the workability of one as well. Contrary to a number of hybrids, a controlled ball flight – as opposed to forgiveness and distance – was the focus of the Apex. If an iron-like, workable hybrid is on your wish-list, the Apex is the one for you. Yes, Big Berthas come in smaller packages than the flagship driver…like the OS hybrid. The Big Bertha OS hybrid seems targeted to the exact opposite market of the Apex. Where the Apex is smaller, with a more iron-like feel, the OS looks and acts like a 5-wood. It has a massive face that wraps around the sole of the club, making for a forgiving surface, though with that forgiveness comes a higher price tag – $250 as compared to the Apex’s $210. Distance, as it always has been, is one of the primary focuses of Big Bertha. The OS features what Callaway is dubbing a “next-generation” Hyper Speed Face Cup, which translates to higher ball speeds and a little extra pop off impact. The overall forgiveness of the club, too, generally caters to added distance, as with a bigger club face comes an increased percentage of hitting the club flush. If the Apex seemed too focused for the low-handicappers, the Big Bertha OS may be the stick to add to the bag. It’s almost as if Callaway had the classic tale of Goldilocks and the Three Bears in mind when designing the line of 2017 hybrids. One is catered for crisp shots and feel, with the caveat that it is tougher to hit and has a more iron-like look; another is massive, forgiving, and made for distance; while the last, the Steelhead XR, is right smack in the middle. Like the Big Bertha, it is big and massively forgiving, though unlike the Bertha, it has a pear-like shape to it, making it look less like a wood and more like a traditional utility. It has a low leading edge, which makes it easy to navigate through the rough, should you find yourself in it, but the head is also deeper, which produces a higher ball flight and a more forgiving face. Simply put: No matter the terrain, the Steelhead XR will find a way to make good contact. Cobra was originally known for its fantastically named utility, the Baffler. The Baffler ushered in the era of hybrids and utility clubs, and Cobra has only improved its products since, with the latest in excellent hybrids being the King F7. Here’s how: Cobra went back in time and used the best elements of the Baffler, and upgraded them into what we see in the King F7. On the sole of the club are the traditional silver baffler rails, orange weight, and orange accenting. The point of the rails was the original use for hybrids: to be able to navigate thick turf and catch flush contact on a longer shot. The King F7 does exactly that. It may be the easiest hybrid to hit out of the rough, as it is the most effective at fighting through thicker grass. The appearance is fairly basic: black, matte face, with a black, glossy head. No frills. Just a club, some grass to get through, and a ball to hit on the green. Lighter seems to be the theme with the Ping G. The head is made from Carpenter 455 Steel that is both stronger and thinner, which cut off 8 grams of weight on the face from the prior model, the G30. The lighter face moved the center of gravity towards the back, which makes the club overall more forgiving to hit, which is, at the end of the day, the goal for the vast majority of hybrids on the market. Like the Big Bertha and the Steelhead XR, it’s a bigger club, more 5-wood like than iron, so it’s appeal will reside mostly with mid- to high-handicappers, though low handicaps can certainly use a little forgiveness as well. Like a good number of Ping products, the G hybrid was designed ultimately for forgiveness and consistent ball flight – even on misses, don’t expect the G to allow a ball to stray too far off the desired path. Where it might lag in distance, it atones for in consistency. Given that this is a piece of TaylorMade equipment, one thing should be patently clear: This club’s goal is distance first, everything else second. As such, the M2 has a draw bias, so if a little movement on the ball flight is what you seek, the M2 is a good place to start. 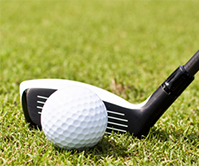 In promoting distance, the clubhead is made of exclusively steel, and is more of a miniature wood than glorified iron. Because of that size, it may appear to some to be a tad bulky, but that’s also a product of the taller face, which produces forgiveness, which, you guessed it, improves distance – the more flush hits a player has, the more distance they’ll have. On the bottom of the club is what TaylorMade is calling a Speed Pocket, which has a similar effect to the Cobra King 7 rails, which make it easier to maintain club speed through thicker rough. Like with other manufacturers with more than one offering in the hybrid market, TaylorMade has an option with maximum forgiveness and one with more playability better golfers. The latter for TaylorMade is the M1. It also features the Speed Pocket behind the face, but looks far sleeker and more iron-like at address. It is also adjustable, allowing for changes of 1/- 1.5 degrees across its twelve different settings. Add to that a moveable weight along a track and you have a very customizable tool in your hands, allowing you to adjust loft and draw/fade bias with a few quick adjustments. There’s a good reason everyone raves about Shoal Creek. The beautifully-designed Northland course has been ranked by Golfweek in the top five in Missouri each year since 2006 and ranks among the top 25 courses in the U.S. as rated by layout on GolfAdvisor.com. On top of that, it’s always been one of our favorites here at KC Golfer and KCmetroGolf.com, too. 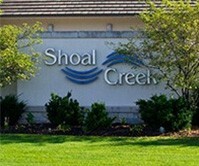 Besides the great layout and wonderful design, Shoal Creek is a local favorite also because of their superior service. The par 71 zoysia course with bent grass greens was designed by Steve Wolfard and opened in August, 2001. It plays 6,950 yards from the back tees and features challenging elevation changes in an idyllic setting designed to enhance a feeling of relaxation. Development in the area continues to increase. “There’s nowhere in the city that’s developing as fast as the Northland,” he said. “There are more developments going in on the east and south sides of the course, but even when the house are in, they won’t be up and down each hole like you’d see on some other courses. With a course rating of 73.9 and slope rating of 136, there’s plenty to challenge good golfers and plenty for average golfers to enjoy. The front nine features wide landing areas on wooded holes, with the longest hole on the course, the straightaway par five Number 7 playing 579 yards from the gold tees. The first nine finishes with the par five Number 9 measuring out at 536 yards with a sharp dogleg right. All of the water is on the back nine, which features fewer trees but somewhat tighter fairways, and is where Shoal Creek’s one-two punch puts a finishing touch on an enjoyable round. Owned by the city of Kansas City and managed by KemperSports, and offers a variety of other amenities, in addition to the terrific golf. Those amenities include a well-designed, modern clubhouse which can house banquets, parties and wedding receptions of up to 250 guests. The spaces inside the clubhouse include the ballroom as well as the Fireplace Lounge – a more intimate setting for groups up to thirty. Add in the Players Grill, seating 50 and with a full bar, as well as the Pro Shop, and Shoal Creek has everything you would expect of a top-tier clubhouse experience. The two-tier, 12,000-square foot practice area features 25 hitting stations and six target greens. Shoal Creek has been a past site for the Kansas City Amateur tournament and will be hosting the U.S. Amateur qualifier this year. “We have a lot of corporate charity outings during the year,” Plymell said, estimating that 7,000 of their 30,000-to-32,000 annual rounds are in those events. Staff are equipped to handle tournament events with up to 160 players. One of the most important tournaments will take place July 30 with a memorial tournament honoring Colonel Rod Yeager, a retired Air Force Colonel and PGA Professional who passed away in February. Shoal Creek hopes to raise $30,000 for PGA HOPE (Helping Our Patriots Everywhere); they are asking for sponsors and silent auction items, and have hole sponsorships available. In addition to the popular St. Paddy’s Day and Halloween tournaments, there are daily leagues. “We do offer memberships as well, so we’ve got daily play and membership play pretty much every day,” Plymell said. Annual passes range from $215 to $439 per month, and daily play is affordably priced from $30 (twilight rate) to $69 for prime-time weekend play. And with some of the best golf in the region, Shoal Creek is a truly inviting place to play.